Past and present collide in Italy’s captivating capital city, where ancient ruins, art-filled churches, and exquisite food exist side by side. Experience a side of Rome that other travelers may not see as you learn a new skill, sample Roman delicacies, or tour the Eternal City like a VIP. Whether you’re traveling solo or with the whole family, a hands-on workshop is a memorable way to experience Roman culture. Enroll in gladiator school for an interactive history lesson, recreate the works of the masters in a fresco-painting workshop, or take a crash course in Italian. From its trattories to its gelato shops, Rome ranks among Europe’s greatest food destinations—one best explored with a little help from a local. Nibble your way through the Prati District at sunset, discover insider favorites in Campo Marzio and the Jewish Ghetto, or relax with an evening of Italian wine, cheese, and painting. While heavy hitters like the Colosseum, Vatican Museums, and St. Peter’s Basilica can be packed full of crowds, these activities take you off the beaten tourist path to explore Rome’s side streets and hidden gems. See the city in a new light as you cycle past Roman street art, raft along the Tiber River, or head out of the city to kayak across Lake Albano. Rome’s star attractions welcome millions of visitors annually, but these exclusive tours allow you escape crowds and see city highlights in a way very few people get to experience. Enter the Vatican alongside the official key keeper, stand in the Sistine Chapel before it opens to the public, and peruse the Gallery of Maps and Raphael’s Rooms as the lights are first switched on. Not many people can say they've spent time in the Sistine Chapel alone—until now. This first-ever experience, only available through Viator and TripAdvisor, grants you entry into the Vatican Museums with the clavigero (key keeper), a staff member with the privilege of opening the doors to the Vatican Museums and its galleries, at least an hour before standard early access tours. 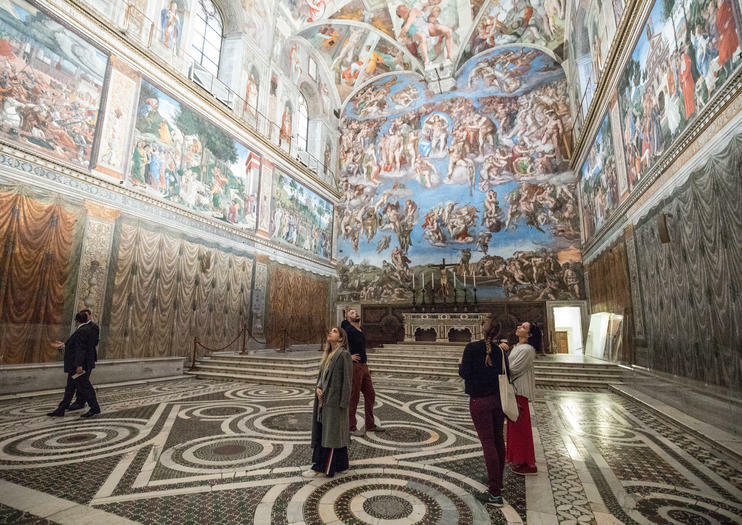 You and your small group get to see the Gallery of Maps and Raphael’s Rooms as the lights are switched on—something never before witnessed by the public—and enjoy a rare guided visit inside the Sistine Chapel. Breakfast in the Pinecone Courtyard is an added bonus. Immerse yourself in the flavors of the ‘Eternal City’ on a 4-hour tour through Rome’s iconic foods and wine. Visit a series of seven local restaurants in Campo Marzio and the Jewish Ghetto for tastings that range from fish and meat to pizza, pasta and desserts served alongside Italian wines. Take in the city’s historic sites as you go, with time to explore classic piazzas, ancient Roman sites, temples and a synagogue. Finish your tour with inside tips on the best places to eat, drink and explore in Rome. Create your own souvenir during a 3.5-hour mosaic workshop in Rome. Regardless of experience level, it’s a great activity for both children and adults. Take a short tour of the Trastevere neighborhood, then enjoy a leisurely workshop with your teacher. Choose from a variety of designs, then let the creativity flow. With maximum eight people in each class, you get lots of personal attention from your instructor. If you come to Rome and only speak English, you might loose the best part of your trip, which means meeting locals and understanding Italian culture.This little course will give you the chance to learn Italian with an emphasis on communicative methods as well as learning about intercultural aspects by fostering an authentic use of the language. ​At 10.00 am we will meet in a café and spend some time learning some Italian expressions.Then walking into the famous market of Testaccio, we will immerse into real context and we will practice the language in everyday situations, while meeting extremely friendly locals. I can guarantee that learning a language has never been more fun!We will finish our experience with a delightful cheese and wine tasting.This course is conceived either for those who are absolute beginners and for those who know Italian already and is supported by a Survival Italian Booklet, a basic guide which will avoid you to get lost in Italy. Discover the street art of Rome on a 4-hour tour by electric bicycle that also passes historical landmarks in the Eternal City. Follow your experienced guide through districts such as Trastevere, Testaccio, Ostiense, Garbatella and Tor Marancia to take in street art and colorful murals by artists like Sten and Lex, Blu and Kid Akne. Expect to also ride your pedal-assisted electric bike up some of the Seven Hills of Rome, enjoy sweeping views and see landmarks including Circus Maximus, the Jewish Ghetto and Piazza Navona. Create art while tasting Italian wine on this evening tour. Accompanied by a guide, visit places like the Baroque Piazza Farnese and the frescoes at Basilica Sant’ Andrea della Valle to learn about Italian art and take inspiration. Continue to the art studio, where you can eat local cheese, prosciutto, and pasta and sip wine as you paint your own canvas. For years we are certified rafting guides, we had the pleasure of practicing this beautiful discipline on many rivers in Italy and abroad. We decided to transform our passion and transmit it to others in our city, the eternal Rome, and let our guests live a unique and unforgettable emotion, let them know "the Eternal City" from another point of view, through the Tiber river, tell the city in rafting!The Tiber on Rome is not navigable by anyone, except from us and our dinghies, we have all the permits and requirements to let you know the city making you experience unique emotions. Of all the dishes for which Italy is famous, few satisfy the appetite like pizza—but making it the traditional Italian way requires practise. During this afternoon or evening cookery class, use fresh ingredients and follow time-honored techniques for the perfect Italian pizza. With helpful hints from your instructor, spin your dough, select your toppings, and savor a slice or more of your delicious pizza with a glass of wine. Pick up a paintbrush and try your hand at recreating famous images during this workshop. Designed for kids and adults, this workshop begins with outlining a painting and then bringing it to life with color. Get advice from the teachers and take home your creation after the class. With the kayak we will let you discover and tell you about ancient Roman ports,(www.instagram.com/romekayaktour) the naumachie (simulation of ancient Roman battles), the trampoline where the popes dived in the untouched lake waters, an ancient prehistoric village where kayak can still be see all the piles, and many other unique places immersed in nature.